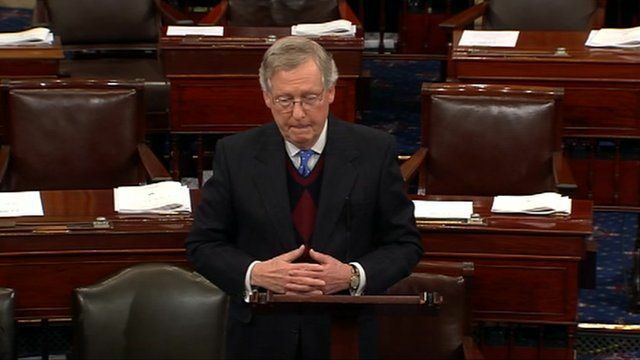 Republicans: 'No blank cheque' Jump to media player US Senate minority leader Mitch McConnell says Republicans will not write a "blank cheque" in last-minute talks to avoid the fiscal cliff. 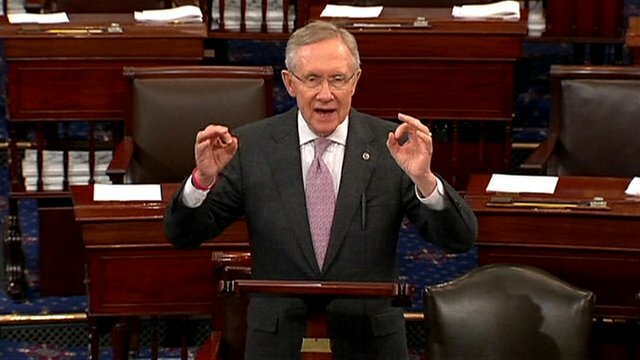 US Senate minority leader Mitch McConnell says he will consider proposals from Democrats in a bid to avert the so-called "fiscal cliff", and is hopeful that an "agreement of some kind" could be reached before the end-of-year deadline. But Mr McConnell warned he was not prepared to "write a blank cheque". The fiscal cliff is a combination of deep, mandatory, across-the-board spending cuts and tax rises due to take effect on 1 January. Economists have warned that if Congress does not take action to avert the fiscal cliff, the US could tip back into recession.